So as September drew to a close, we were (and are) still harvesting our late season tomatoes. One thing that happened this year, is that some of my Roma tomatoes were mislabeled as cherry tomatoes, so we had way too many cherry tomatoes this year. This happened to my Dad too. And I hear this happens to a lot of gardeners. I had about 10 cups worth and found out you could roast them up and make a smooth tomato sauce base for pasta, and you can freeze it for about 6-10 months. It is super easy to make, and something I am going to do from now on. Like when I have way too many extra cherry tomatoes, or when you buy that giant Costco veggie tray for a party and you have leftover cherry tomatoes for days? Roast them up and make a sauce! It comes out super sweet, and worth the extra effort. Also, fair warning, my 10 cups of cherry maters (with a couple of plums thrown in) reduced down to about just under 3 cups of sauce. So if you want a lot of sauce to freeze, you will need a lot of cherry tomatoes. Preheat oven to 425˚. Wash tomatoes and pick through them. Place tomatoes on two foil-lined baking sheets, and drizzle all the tomatoes with the olive oil, and sprinkle with all the seasonings evenly. Bake the tomatoes for about 45 minutes, flipping and rotating the sheets once during roasting. Tomatoes should be caramelized and releasing their juices. Let cool for about 30 minutes. 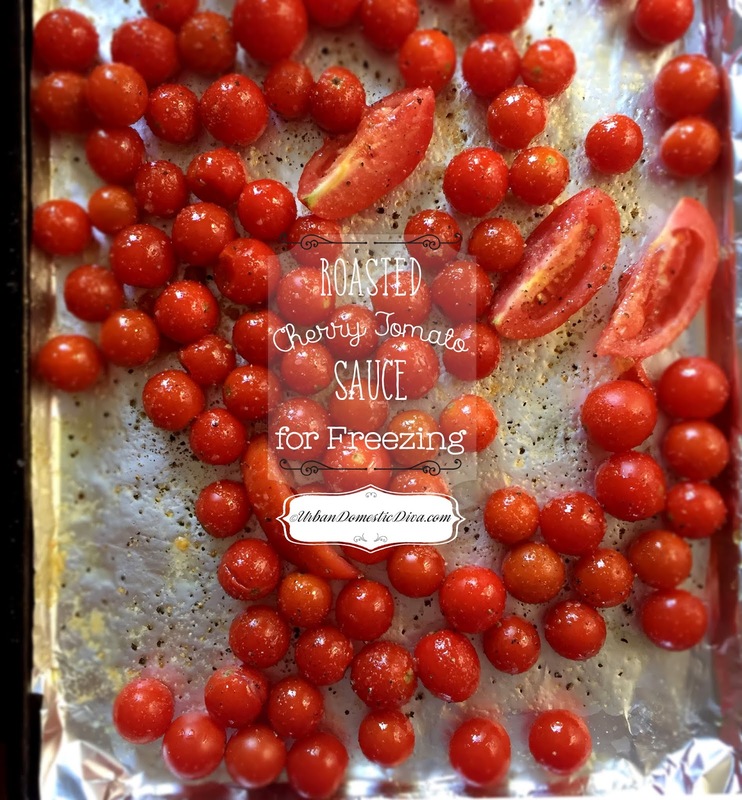 Scrape tomatoes and all their juices and seasonings into a blender or food processor, and puree until smooth. Pour the pureed tomatoes into a fine-mesh sieve over a large bowl. Using a spatula, push through the tomatoes until just seeds and skins are left. Pour the sauce into a storage container and freeze for 6-8 months. Use in a simple marinara recipe to serve over pasta or other recipes that need a super-sweet tomato puree.